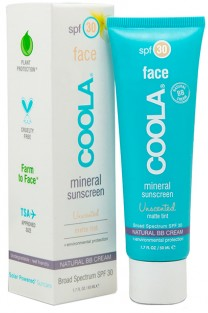 I am IN LOVE with this mineral sunscreen! I kid you not it is the best I have ever used! It is %100 odorless. I know I gave it a 5 on the scent, but that is because I love that it is odorless! Most Sunscreen smells awful (you know the smell they all have) but not this one! It's lack of added scents also makes it suitable for people with sensitive skin. It is perfect for the face. It is also weightless almost instantly. It doesn't make your face look shiny or oily and it has SPF 30 (the recommendation for your face is 15)! It does have a slight tint and claims to work as a BB cream of sorts, while I am not so sure about that (it doesn't have any other benefits than sunscreen and it provides no coverage) it is an AMAZING sunscreen! There are no cons to this product for me!